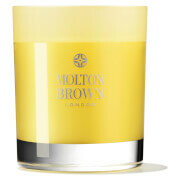 Infuse an uplifting fragrance into your home with Molton Brown's Vintage 2016 with Elderflower Single Wick Candle, inspired by the vineyards of Champagne-Ardenne in Northern France. Housed in a shimmering gold container, the candle blends notes of sparkling Grapefruit and Mandarin with an aromatic heart of Elderflower, Petitgrain and Coriander to create a captivating scent. 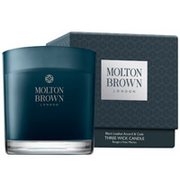 Finishes with a warming, magical base of Vetiver and Ambergris. Heart Notes: Elderflower, Petitgrain, Coriander.